The All Indian Pueblo Council (AIPC) has a long, rich and storied history. The deep-rooted fortitude of our Pueblo leaders to advance our people, protect the teachings of the past and prepare our young for the future will always be at the heart of our Pueblo communities and Pueblo leadership. 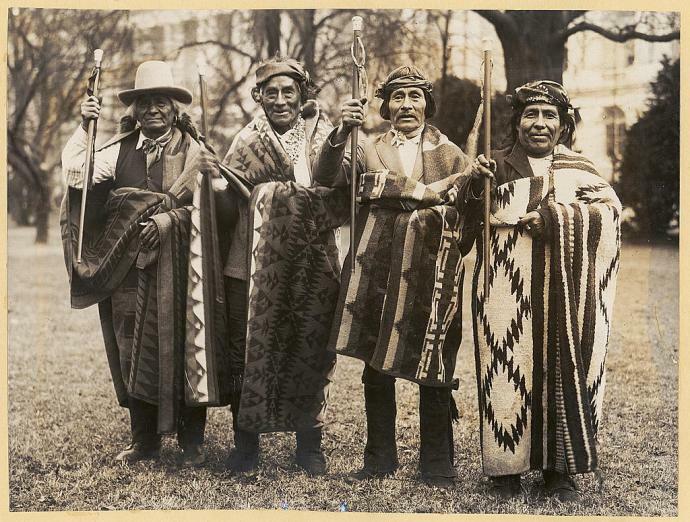 AIPC has been credited with leading the fight on many major legislative, cultural and government issues like the Pueblo Land Claims Act, the return of Taos Blue Lake, and many other efforts that have protected livelihoods, customs and traditions, and took strong stands on issues like the Indian Civil Rights Acts of 1968 that the Pueblos opposed. AIPC, Inc. was incorporated in 1970 to secure federal funds for education and economic development programs. Although it accomplished the goals of self-determination it faced many organizational challenges. By the 1980’s AIPC, Inc. had evolved into a complex corporate organization, managing multiple social and economic programs, in addition to managing millions of dollars. Getting off course from its original governance role as a collective advocator for Pueblo issues resulted in fragmented advocacy, leadership challenges, and financial mismanagement. This lead to dissolving AIPC, Inc. in 1988. It later re-established itself as a non-profit organization. 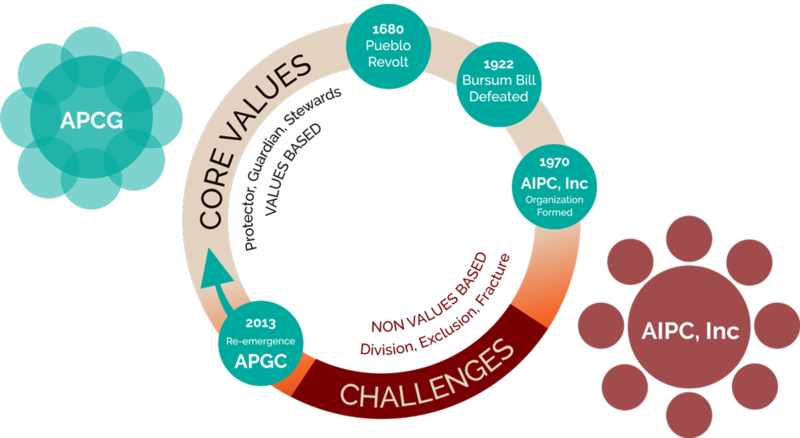 As a result of external forces and internal triggers, in 2013 the Governors from the 20 represented Pueblos took action to dissolve the AIPC, Inc. non-profit organization. The APCG was formed to continue with the core structure, purpose and values of the original AIPC set forth by our forefathers. Pueblo leaders successfully coordinated an attack and rebellion to drive out Spaniards. After the U.S. – Mexican War ended, 19 Pueblo Governors were presented with signature canes from the U.S. in recognition of their governorship and sovereignty, and as part of the successful ratification of the Pueblo Land Patents. Pueblo leaders formed a delegation to go to Washington and successfully protested the Bursum Bill. ALL INDIAN PUEBLO COUNCIL BECOMES A FORMAL ORGANIZATION, AIPC, INC.
New federal policies and funds allow AIPC, Inc to take control of and manage government programs. Taos Pueblo safeguards its water supply, natural and domestic resources, and the locale of cultural events. AIPC, Inc. evolves into a complex corporate organization, getting off course from its original governance role. The 20 Pueblo Governors of the All Indian Pueblo Council (AIPC) decide to dissolve its current business corporation in order to re-structure and return to the original cultural and leadership model of the council. Governors take responsibility to address the issues, remaining as a governing body and re-emerging as a stronger organization, the All Pueblo Council of Governors (APCG). Organizations overseen by the council, including the Santa Fe Indian School and the Indian Pueblo Cultural Center were not affected.